Cyclone Sagar struck the country on 19 and 20 May, bringing torrential rains. The precipitations received, about 110 mm, were the equivalent of the average rainfall for an entire year and triggered heavy flooding, especially in the capital, Djibouti City, and in the southern Balbala suburb. Up to 50 000 people have been affected and at least 1 500 shelters have been damaged in Djibouti City, potentially displacing at least 7 000 people. Over 100 urban vegetable and fruit plots have been inundated, affecting the livelihoods of over 500 people, including vulnerable migrant workers. While floodwaters are now receding, several areas remain inundated. There is still concern as more rains are expected in the coming days due to the formation of another weather system in the Arabian Sea. 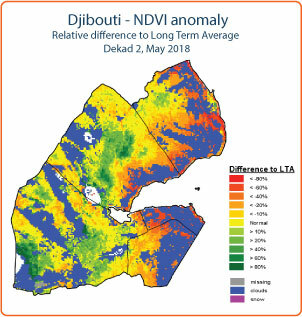 In rural coastal areas, where seasonally dry conditions currently prevail, remote sensing analysis indicates poor vegetation conditions, due to a faster-than-normal rangeland depletion after the dismal performance of the October-February “xeys/dadaa” rains. In inland pastoral areas of Dikhil and Tadjourah regions, the 2018 March-May “diraac/sougum” rains had a late onset, with no significant precipitations received until early April and seasonal cumulative amounts were between 25 and 40 percent below average. However, current rangeland conditions are above average in several areas, due to the beneficial impact on pastures of some off-season precipitations received in January and February and of the above-average 2017 July-September “karan/karma” rains. The country hosts about 27 000 refugees from Somalia, Ethiopia, Eritrea and Yemen, depending on the humanitarian assistance. About 15 000 refugees are residing in the Ali Addeh refugee camp, while about 5 300 are located in Djibouti City. Both areas have been affected by the tropical Cyclone Sagar, causing damage to shelters and infrastructures and resulting in an increase in humanitarian needs.